Does Chartbeat slow sites down? A few Chartbeat users have told us that when their sites are loading slowly they see ‘loading ping.chartbeat.net’ hanging in their browser status bar. Their browser seems to be telling them that Chartbeat is slowing down their page load. However, just as with other analytics services like Google Analytics, in most cases the browser isn’t saying that it’s waiting on Chartbeat because it’s loading slowly, but because the code is positioned at the bottom of the page and thus is referenced when any file on the page is loading slowly. So why does my browser say waiting for ping.chartbeat.net? Browsers put priorities on which files need to finish loading before requesting new files. Chartbeat’s code is the last code that the browser requests. If files higher in priority are loading slowly, then the browser waits for those files to load before requesting the chartbeat code. When this happens, some browsers (particularly Firefox) display a message in the status bar saying ‘waiting for ping.chartbeat.net’, but what they really mean is ‘we’re waiting for the current file we’re requesting to finish loading so that we can get down to ping.chartbeat.net and load that’. It’s shorthand that browsers often tell about whatever code happens to be at the bottom of the page. If you have concerns about Chartbeat and page load time, the most important thing to check is that the chartbeat code is positioned just before the /body tag. If you are still having problems, please contact us either through our Uservoice page or by emailing us at support@chartbeat.com and we’ll be happy to help. Chartbeat no longer requires Paypal! We’ve made a range of changes to the Chartbeat homepage so that it’s even easier to set up real-time analytics on your site. The most important is that Chartbeat no longer requires you to go to Paypal during the signup. 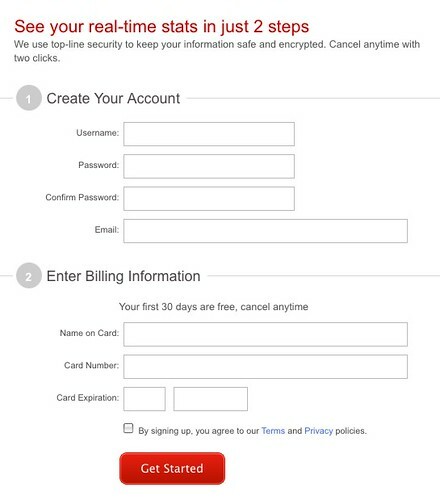 Instead, the entire signup process is on one page and takes less than a minute from start to finish. We’ve also added a Tour so that users can better understand some of the powerful features that chartbeat provides and a Buzz section so you can see what other people are saying about us. Take a look!